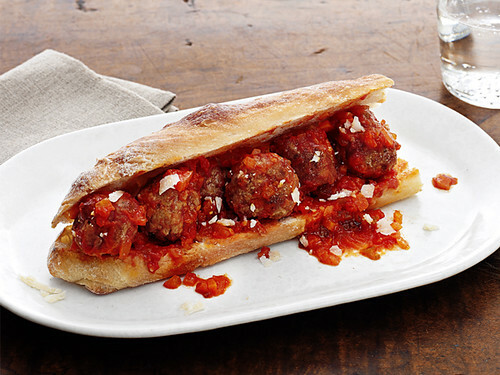 Meaty, saucy, bready, and filling – this is the meatball submarine sandwich. To make the sauce, take 2 tablespoons extra-virgin olive oil, 1/2 small onion, finely chopped 1 stalk celery, finely chopped, 1/2 medium carrotchopped, salt, 1 28-ounce can whole plum tomatoes, crushed, 1 bay leaf, 2 fresh basil leaves. For the meatballs take 4 ounces russet potato, peeled, salt,1 pound ground veal shoulder, 1/3 cup grated parmesan cheese, 2 tablespoons whole milk, 1 1/2 teaspoons minced garlic, 1 teaspoon chopped fresh thyme, 1/4 cup extra-virgin olive oil, ground pepper, and 4 to 6 pieces baguette. To make the sauce heat the oil in a saucepan over medium flame and add onion, celery, carrot, and salt and cook. Stir occasionally, until soft. Stir in tomatoes and their juices, the bay leaf, basil and 1/2 cup water. Bring to a simmer and cook, stirring occasionally, until the sauce thickens. Season. Make the meatballs by putting the potato in a saucepan with salted water and bring to a boil. Cook until the potato is tender. Cool then grate. Mix the ground veal, parmesan, milk, garlic, thyme, 1 tablespoon olive oil, 1/4 teaspoon pepper, and salt with your hands until combined. Form the mixture into 1-inch meatballs. Heat the remaining olive oil in a large nonstick skillet over medium-high heat. Add the meatballs and cook until browned. Add sauce and cook for a further 5 minutes. Fill the baguettepieces with meatballs and add more sauce.